Remember on The Hills when Spencer Pratt tried to channel his Heidi Montag-induced rage into crystals? “I know they’re not working, that’s why there’s hundreds on me right now!” Pratt fumed to the delight of viewers before going on to spend a reported $1 million on the stones. Well, it would appear that the fashion world is attempting to do something similar, only minus the all the anger and unfortunate bead necklaces. While wellness-minded celebrities like Kim Kardashian West, Bella Hadid, Miranda Kerr, and (duh) Gwyneth Paltrow have long copped to collecting crystals, their appearance in high fashion collections and presentations is new. The prime example came during New York Fashion Week this season, when Mary-Kate and Ashley Olsen passed out white and black stones to guests at their show for label The Row. According to The Cut, the pair thoughtfully selected white quartz to promote harmony and black tourmaline to ward off negative energies. Whether or not the stones worked to keep the coterie of editors and influencers in attendance safe from any bad Fashion Month juju is yet unknown, but really, doesn’t any object bestowed by the Olsen twins seem like it would be imbued with a certain degree of magic power? A few days later, in London, designer Ashley Williams used a crystal as the invitations for her show, which was all about “ditching technology and...exploring the UK and all its monolithic marvels.” In other words, camping by pagan stone circle formations and partaking in druidic rituals, all while dressed in tie-dye hoodies and bucket hats. In January, British menswear duo Cottweiler staged their show in a hall full of crystals and other stones in the Natural History Museum, while for SS18, longtime crystal devotee Victoria Beckham not only designed jewellery made from jade, howlite, jasper, and calcite for her collection, she also created a pair of wide-leg trousers with a special hidden pocket to store stones in. 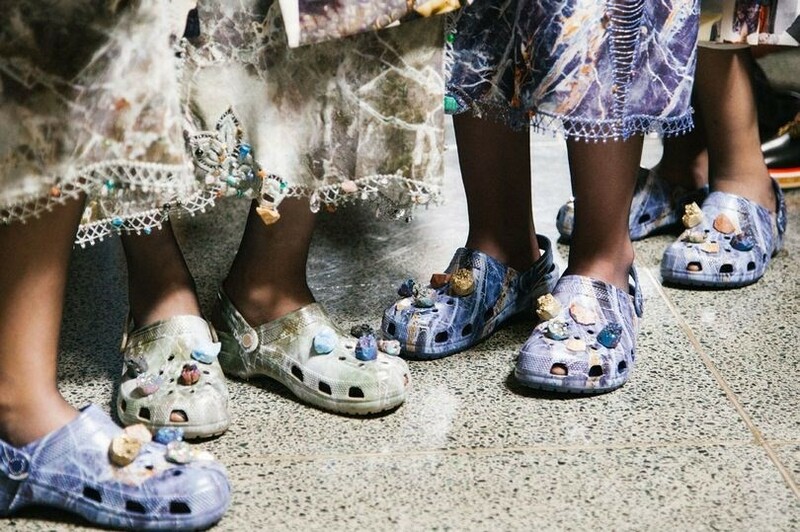 Elsewhere, Riccardo Tisci's models wore huge slices of agate around their necks as part of his SS17 Givenchy collection, and, if you can remember back to the days before elevated Crocs were under Balenciaga’s sole purview, you’ll recall that Christopher Kane festooned some awfully crystal-like rocks to pairs of rubber shoes that very same season. Crystal healing has been practiced for thousands of years, while Goop has been extolling its virtues for the better part of a decade. So why is the fashion world suddenly taking note now? For one thing, other ancient traditions like tarot reading and herbalism have also recently found dedicated practitioners in internet-savvy Gen-Z women, in particular. Astrology, once just a way to use up real estate in the back pages of fashion and lifestyle mags, has seen similarly renewed interest in the digital age, from Susan Miller’s devoted online following to the many meme accounts making ‘starter packs’ based on the various zodiac signs. 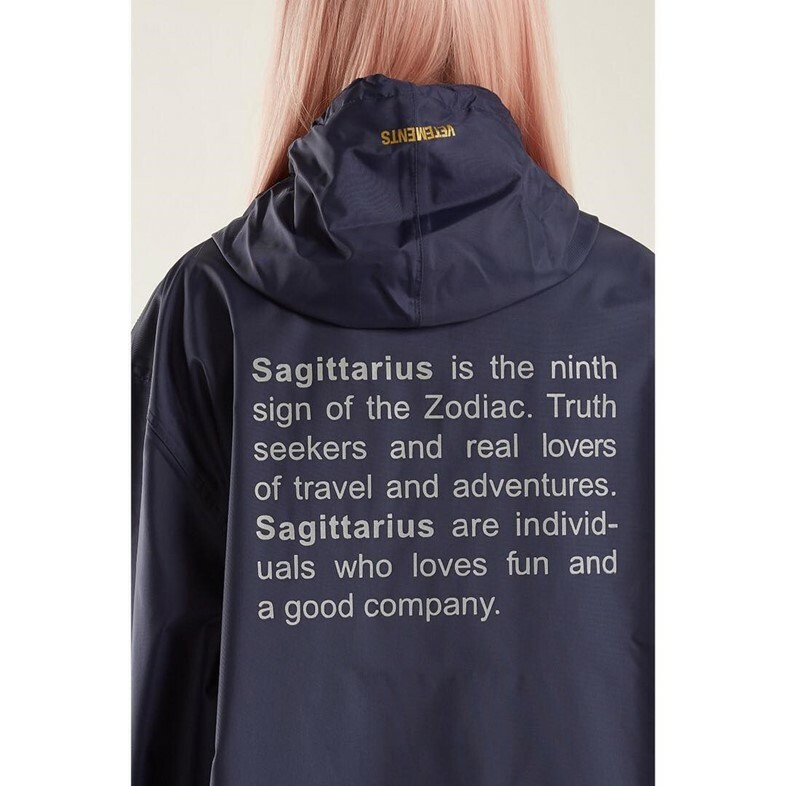 And since Vetements already kind of cornered the market on horoscope-inspired garb, crystals seem as natural a choice as any for designers seeking to communicate a degree of vague spirituality to an audience hungry for just that. And hungry for it we are. Fashion’s fascination with the spiritual can be seen as a manifestation of our yearning to slow down and centre ourselves in an information-saturated, always-on world that has made it increasingly difficult to do so. It’s ironic, then, that the same digital platforms that have given way to a renewed interest such new age-y hobbies are partially responsible for the collective spiritual bankruptcy that has found so many of us looking to them in search of balance and meaning. Lee says that because fashion designers, like artists, musicians, writers, and other creatives are naturally more in tune with rhythms of the world, designers like Beckham and the Olsens are simply catching onto something universal – namely, a need to centre ourselves through spirituality – before the rest of us. Knowing what I know about these women, this sounds about right. It would also explain a lot about Gwyneth Paltrow. But fashion, with its notoriously fickle nature, is also one of the biggest culprits of the kind of emotional, physical, and spiritual unrest that make activities like collecting crystals seem like an appealing and entirely sane coping mechanism. The industry has always been and probably will always be about not just what’s now, but what’s next, be it fancy Crocs or manufactured spirituality – there’s no time to take a break. Will a crystal really bring you inner peace if you get emails at a rate of ten a second, compulsively refresh Instagram every two minutes and haven’t turned your iPhone off in four years? I guess we’ll have to wait for the editors to come back from fashion week to find out.